Georgine Yorgey is the Associate Director of WSU’s Center for Sustaining Agriculture and Natural Resources, where she has worked since 2009. She leads the Center’s efforts around recovery of organic wastes through the Waste to Fuels program, co-leads efforts relating to climate change and agriculture, and contributes to Center-wide efforts relating to the BIOAg and food systems programs. 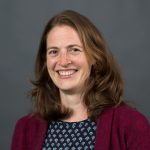 She publishes in academic and extension publications, with recent efforts that include the Farmer-to-Farmer Case Studies: Enhancing Resilience of Farming in the Pacific Northwest (13 case studies, 2016-current), and co-editing and co-authoring chapters in Advances in Dryland Farming in the Inland Pacific Northwest (2017). Georgine grew up in Oregon, where early exposure to vegetable and fruit breeding and food processing convinced her that she wanted to work on issues related to agriculture and sustainability. She earned a Bachelor of Arts with High Honors from Swarthmore College in 1999 (with a major in Biology and a minor in Sociology & Anthropology), and a Master of Public Administration degree from University of Washington in 2008. Honors and Awards: Washington Organic Recycling Council, Excellence in Education and Outreach Award (2015); WSU CAHNRS Interdisciplinary Team Award (2011); USDA NIFA Partnership Award for Innovative Program Models (2009). Areas of Current Interest: regional food, water and energy nexus; recovery of energy and nutrients from organic wastes; climate change and regional agriculture; and stakeholder engagement for climate modeling efforts.